So I haven't bought any Pyrex in forever. At least it feels like it. It isn't that I haven't seen Pyrex, I have seen some. Some expensive. Some not so expensive. But nothing for me. How sad. So here is what I did not buy. DWD bottom. Lots of black marks. Lid was nice. Even with a good scrub and some oil there was no hope as parts of the color where gone. Sad because I need the bottom. I have the lid. But really at $8 it is too much. I need this! I wanted this. But I practiced self control beacise I will not pay that for one bowl of a set I could not care less about owning, but I have the 444 so one day, FOR THE RIGHT PRICE, I will complete it. UGG this is why I am not buying much. I am not paying that for a bowl. Yes I love Pyrex, but when it comes down to it they are just dishes. I own it anyways. Pretty scratched up 401. I love 401s. They are good for soup and cereal. But again, I have this one. I hate these things. The thrift stores think they are gold or something. I find them all of the time. I do not buy them. I just don't like them or have a mixer they would fit. Or want them at all. Yuck. I found the Town and Countries the week I got back from vacation. It took until last week to sell them. That says something abut their pricing. Way to freaking high. Oh well, save my money for the good ones right? Right! Talk me into not spending an arm and leg at an antique store just to get something. This stuff is like crack! Hey I just noticed I almost am at 10 posts for the stuff I did not buy. Average 5 Pieces per post, so almost 50 pieces I have not bought. I need a ribbon, my husband would be proud. The thrift stores around me act like the Pyrex they sell is gold. The prices are way too high. There is an antique "mall" I visit and I ran into one of the booth sellers. She asked me to make an offer if I wanted. I said $3 for a small bowl, she said she had it marked $8. I pointed out the flaws (it was pretty dinged up but I can use it as a crafts bowl) and she said no way. Mmmkay. I saw those very mixing bowls at a yard sale this past week. The seller wanted $25. I said no, she said $15? I still passed. They are nice and heavy and all but I'd rather have the pretty designs of Pyrex. Yeah, those are some stiff prices. Since I don't NEED any of this stuff, I also refuse to pay those prices as well. I was washing up some Pyrex yesterday that I bought intending to resell over the past couple years (but I'm keeping). Some had the price tags still attached. I wish I could see those prices today. 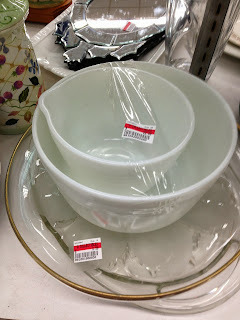 It made me feel good about some of the great deals I got, but reminded me how the thrifts have really gone up. It's gotten to where when I find something I'm afraid to look at the price. I spent $2.95 (10% off for hubby's discount) for a small fridge dish, I only got it because I desperately need lids. But boy was I grumbling over the price. Would have been different if it were a HTF design, but it was just the primary red. 401's are the best! I'm slowly ditching all the Ikea bowls & bringing in a rainbow of 401's.